Ben Carson: Small donor hero. 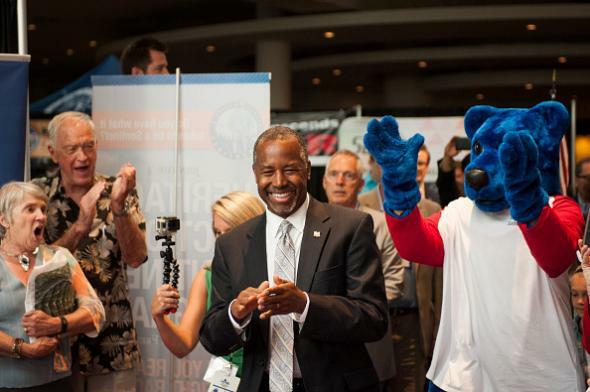 Carson admirers, human and otherwise, at the Western Conservative Summit in Denver on June 27. The only other candidate who even comes close to having half of Carson’s small donors is Clinton, who has 23,300. Carson’s appeal to hard-core conservatives—he’s an accomplished doctor but also a right-wing paranoiac who’s said, for example, that prison can make you gay—was examined by GQ’s Jason Zengerle earlier this year in a profile titled “What if Sarah Palin Were a Brain Surgeon?” Carson is currently running somewhere between fourth and sixth in GOP 2016 polls. * “Jebley” is not actually Jeb Bush’s nickname.